Aquarion wants to build 2 big water tanks on North Avenue. Next Thursday, there will be 2 big meetings about them. The hearings are a result of a petition against Aquarion’s proposal, from 9 immediate property owners and 76 other Westporters. PURA may add more hearings after Thursday, if necessary. Letters will be accepted from the public through the last day of the hearing (Thursday or later). The address is 10 Franklin Square, New Britain, CT 06051. Click here for all filings made in the case thus far. 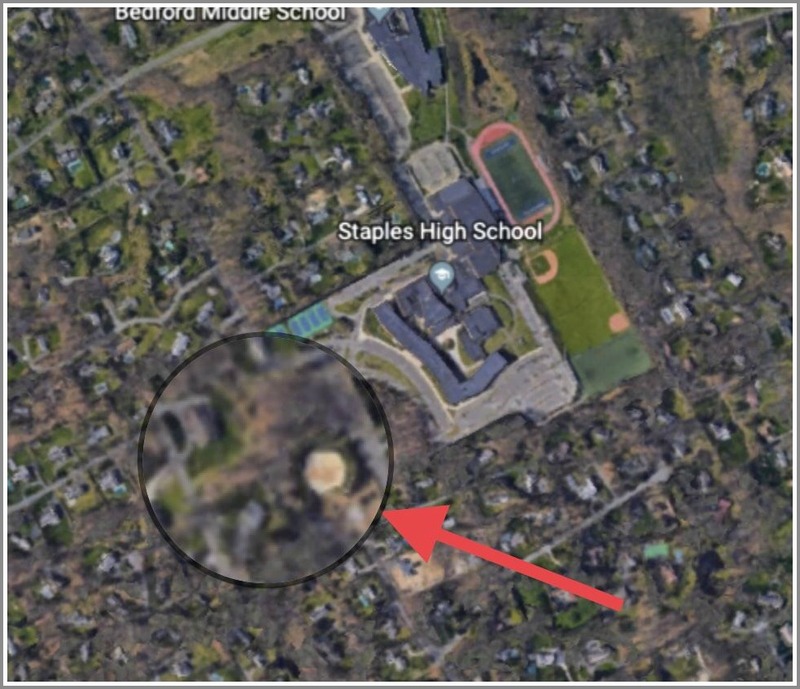 An aerial view shows the North Avenue Aquarion tank site, opposite Staples High School. This entry was posted in Environment, Local politics, Organizations and tagged Aquarion, Connecticut Public Utilities Regulatory Authority, North Avenue water tanks. Bookmark the permalink. The PM meeting is in 201 as there is a standing public P and Z meeting where there are many different major topics to be discussed and voted on. The P&Z hearing which Chip mentioned is huge. It’s concerning the 8-30g proposal to build a 6 story 81 unit apartment building amidst a neighborhood of historic single family homes. One 1860 house is slated to be demolished to become the driveway for the 140 car garage. Previously 4 other historic houses were purposefully left to decay and then were razed, including an 1835 Victorian to allow for this overly dense and completely inappropriate propsal. So Westport has two major issues to be addressed in one night. Choose your poison and come out. Just think Matthew, if State Rep Steinberg who represents Westport was successful with HB 5045, then there would be stricter penalties on Westport if the town failed to loosen zoning regulations and allow more multi story buildings. That bill supported by steinberg would have eliminated the chance for Westport to fight off these projects for not fitting in with our towns character or historic nature. As Steinberg said-Westport “Put up or shut up”. Let’s keep the political barbs out of a serious problem. 8-30g is the issue at hand, not an HB that didnt apply to Westport anyway. Matt-the proposed HB by a Steinberg would have applied to Westport. It could have been andnwould have been more than devastating to our town. Matt-you lose YOUR argument against the massive housing when you refuse to understand how to end this horrible situation and also refuse to admit our State Rep Steinberg is a major supporter of building more. You put Harrford over Westport. Very disappointing. My heart goes out to these neighbors. In downtown Westport, we’ve had to deal with an Aquarion water main replacement project for something like 3 months. If I had ANY idea of just how crazy, chaotic, disruptive and flat out damaging the project was going to be, I would have been way less polite when the matter was before the Board of Selectmen last year. I have nothing against the actual contractor (those people couldn’t be any nicer) but Aquarion’s approach to project management – if the above mentioned water main upgrade may be considered evidence – is Dickensian. Sending good thoughts to our friends near and close to the water towers. You are fighting the good fight. Hoping for good results!! To recap : a company that is under investigation for manipulating the utilities markets, ripping off their customers by $3.6 billion comes to Westport’s P&Z with a request to quadruple the capacity of a local water storage tank and the P&Z doesn’t ask they why they need more capacity. The P&Z rubber stamps the request without the required neighbor notification, any questions or suspicion that they’d be changing the nature of the system. Only after the neighbors work like crazy to reopen the issue does any one ask if the company is changing the location to a regional depot. I thought P&Z was supposed to protect the town from crooks like this!